But why is Soul Beach only inhabited by the young, the beautiful and the dead? Who really murdered Megan Forster? And could Alice be next? Review: Well, what can I say? Firstly, I love the fact this novel is based in London. I became increasingly intrigued that a lot of what happens is connected to Greenwich, which is where I work and a short journey from where I live. 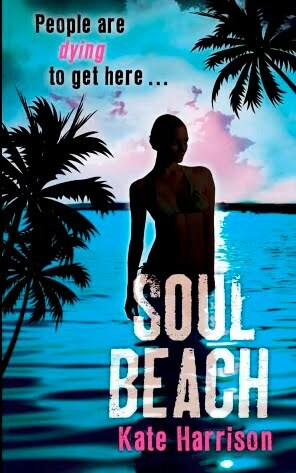 Most YA novels that I read are based in America and with the title being 'Soul Beach' I assumed this would be too. When I read the summary for this book I was intrigued. Alice is surrounded by grief following the death of her beautiful older sister Meggie. How would you feel if you received an email from your dead sibling on the day they died? The pace of this book is fast and exciting. The novel is fun, thrilling and captivating. I'm in awe of each and every page. Everyone grieves in a different way and at a different pace. This is a huge part of Alice's story. When Alice first visits 'Soul Beach' as a reader you are tense and on edge wondering what will happen. I love the way Kate describes everything to do with 'Soul Beach' it makes you feel like you're walking on the sand and can hear the waves rolling in. Everyone on 'Soul Beach' is beautiful and as ever my attraction to the guitarist still shines through. The imagery and explanation of this novel is empowering. 'Soul Beach' is somewhere you can escape from the reality of life. Just like a good book, a song or a DVD can be. I thoroughly enjoyed this novel but the ending was both beautiful and annoying. What a cliffhanger I am eager for the next part of Alice's fantasy/reality story.